Outdoor motorsports events are at the mercy of the weather. This past weekend’s second running of HyrdoBowl in Geneva, New York had a tough time. Friday was completely rained out, Saturday a front came through and delayed the start until mid-afternoon and yesterday, while it was sunny and dry, the wind made for dicy racing conditions. After running a few classes, the called it a day with many boats never being able to get in the water. For a young event, I hope they continue to get support from the community, racers and sponsors as, when the boats were on the water, the action was fast, furious and fun to watch. Inboard hydroplane coming around the turn at speed at the 2012 HydroBowl in Geneva, New York on beautiful blue Seneca Lake. Nikon D700/80-400VR, 1/1000s, f/6.3, ISO 200, EV 0, 400mm focal length. 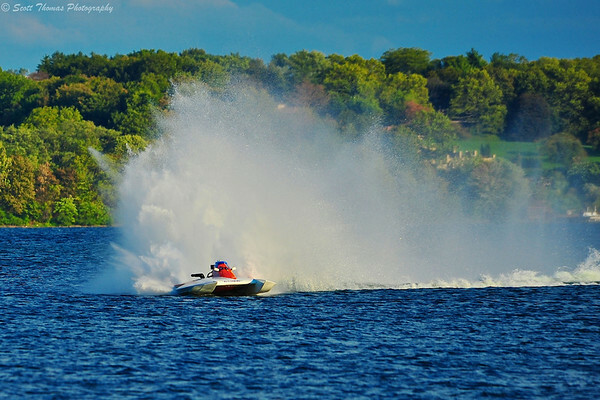 When the weather did break on Saturday, the inboard hydroplanes flew around the shortened race coarse surrounded by the first hints of Autumn on the beautiful blue waters of Seneca Lake. 2.5 Liter Inboard Hydroplane flies down the front stretch at the 2012 HydroBowl in Geneva, New York. Nikon D700/80-400VR, 1/100s, f/20, ISO 200, +0.3, 400mm focal length. I warned you there would be more panning photos coming from this past weekend’s HyrdoBowl. The 2.5 Liter class got in three runs before the racing was called. 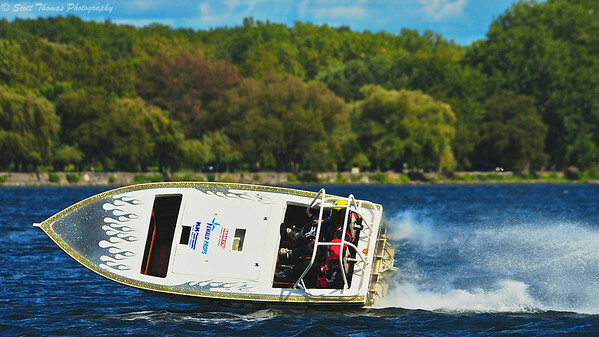 Jersey Speed Skiff leaning into a turn at the 2012 HydroBowl in Geneva, New York. Nikon D700/80-400VR, 1/1600s, f/9, ISO 200, EV +0.3, 400mm focal length. I told you about the Jersey Racing Skiffs before and how much I love to watch them race a couple of years ago. As the Seneca Lake waves increased in size with the gusting winds, the Skiffs put on quite a show during two races for the HyrdoBowl spectators. After the water became too rough for the lighter and faster inboard hydroplanes, the Jersey Racing Skiff drivers and passengers bounced up and over the waves and went nearly vertical in the turns. I am a bit sun and wind burned after spending most of Sunday on a turn boat out on Seneca Lake. Still, I had a great time when the boats were on the course. I want to thank the organizers of HydroBowl for inviting me to photograph this event. 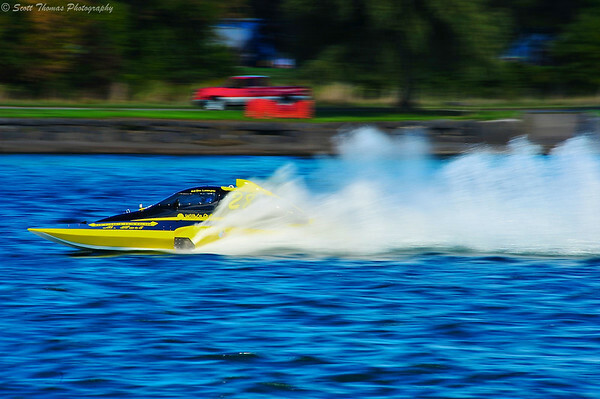 This entry was posted in Sports, Weekly View and tagged 2.5 liter, autumn, finger lakes, geneva, hydrobowl, hydroplane, inboard, jersey skiff, motion, movement, new york, panning, racing, roostertails, seneca lake, water. Bookmark the permalink. Thanks, Juanita! When I get more photos of the JS boats online, I will post some on the FB page.